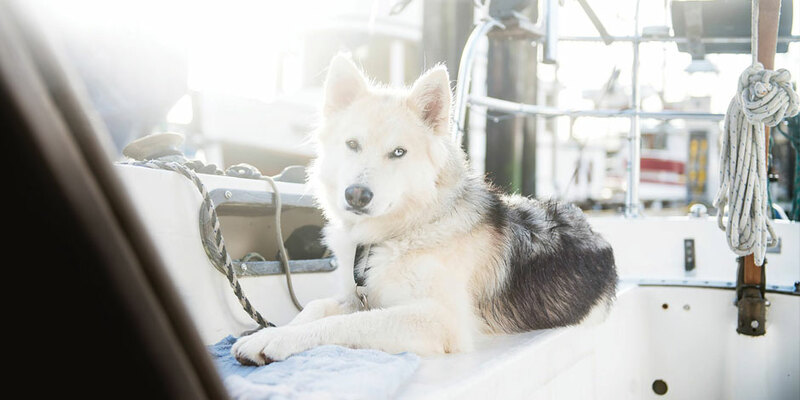 A coast dweller and her dog navigate life’s currents aboard a small sailboat. I’m tied to the dock as a gale grows outside the protection of the bay. Snow is piling up on the sailboat, but tonight I’m not enjoying the warmth from the woodstove aboard Capricorn, the 27ft sailboat I call home. Instead, I’m worriedly perched on her aft deck, peering through the falling snow and into the darkness. Searching. My loyal but not-yet-trusty mutt, River, ran away on our walk this morning. My voice is hoarse from yelling his name into the forest where I last saw him, his tail joyously disappearing into thick salal. At least he’s contained to this little island. Living aboard my small sailboat these past few years has had its challenges. And its rewards. At the end of the day, Capricorn, and her little dinghy, Pisces, are my home. Whether we’re anchored in a bay far beyond the fingertips of civilization or we’re tied to the dock in a port town, we’re always home. We’re always in it—life, I mean. There’s something about living on the sea that demands one’s presence and hands back the gift of a life spent in the depth of the moment. We’re always in the thick of it when buoyed by the sea. It’s now 11pm and I’m about to go back out in search of River, when I hear him barrelling down the dock straight for the sailboat. At the sight of him, relief unties the knot in my gut. I am both glad to see him and exasperated by his independence. Before River, I thought the solo navigation of modern life aboard a sailboat was a constant (mis)adventure. But when this blue-and-brown-eyed husky/malamute mutt unexpectedly joined my life afloat, the plot thickened as we became unlikely shipmates. We look after one another, above all else. River approaches with tongue flopped merrily out the side of a wide, wolfish grin. His fur, usually white, is black from ear to paw, starkly contrasted against the fresh snow. The knot in my gut tangles once more. He leaps into the cockpit of our sailboat, mud flying, as he leaves a wake of black paw prints on the deck. Before I can stop him, he’s already down in the boat and on the bed, scarfing down my dinner from the galley counter. “RIV-ER,” I shout, for the thousandth time that day. When I step inside to have a stern word regarding the ins and outs of being a respectful shipmate, a putrid stench stops me in my tracks and I gasp for fresh air. Banishing River to the cockpit, I put on the kettle. Who doesn’t love giving a midnight sponge bath to a dog covered in rancid otter feces and bog mud? A few buckets of soapy warm water later, I deem River clean enough for the small bunk we share. For the most part the smell of wet dog replaces the smell of otter crap, and we drift to sleep. Sharing a simple and honest life with River aboard Capricorn isn’t glamorous. It certainly isn’t perfect. It’s messy and fulfilling. It’s challenging in a way that fosters growth and strength, and easy in the way that comes when you know you’re exactly where you’re supposed to be. I hold a boatload of stories stored fondly in my heart that anchor me to this way of life. It feels strange to say the sea grounds me, but it does. I wake after nights of rising and falling with the tides, dance to the beat of the seasons as they come and go, and make the most of each day with my shipmate. That is enough for me.